Canada has the best backyard in the world, and part of that is thanks to our national parks. 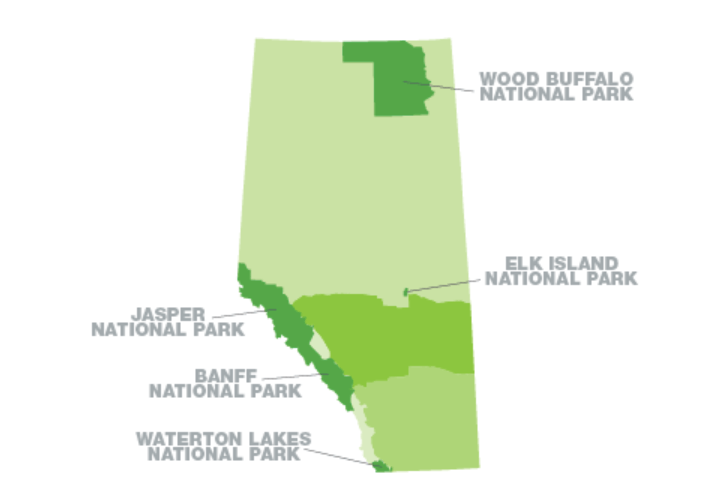 Alberta is home to five of Canada’s national parks, one of them being our country’s first, and another being our country’s biggest. If you’ve never paid them a visit, or haven’t got around to visiting one yet this season, there’s still lots of time to get out there and enjoy them this summer. For your own safety, please make sure you are prepared before heading out on your next adventure. Information on how to prepare for your trip and stay safe while on your hike is available from Albertaparks.ca, Parks Canada, and AdventureSmart. When railway workers came across a thermal hot spring back in 1885, it wasn’t long before Banff became the first national park in Canada. There are more than 1,600 kilometres of maintained trails that can be explored on foot, by bike, or on horseback. When you add that to the hot springs and some of the best skiing in the world, Banff is a perfect year-round getaway. The best part? At 127 kilometres away from Calgary, it’s basically on our back step. During Banff’s peak season from June to September, there are well over 2,000 campsites through 14 campgrounds that offer a variety of amenities. Costs for camping vary between campgrounds and range from $15.70 per night to $120 per night. Located 342 kilometres north of Calgary, Elk Island National Park has an important history in the preservation of bison. Around 1907, the Canadian government bought one of the last and largest herds of pure-bred plains bison from Montana. The bison were temporarily moved to Elk Island until their permanent home in Buffalo Park (not to be confused with Wood Buffalo National Park, we’ll get to that later) was complete. Between 40 to 70 bison escaped recapture, and those animals are the ancestors of Elk Island’s modern herd. The park also played a role in preserving the wood bison, when 23 of the then-critically endangered animals were moved to the south side of the park, where a modern herd of about 300 currently live as the most genetically pure wood bison remaining in the world. Camping in Elk Island gives you a wide range of options, from the classic camping style of “roughing it” to a spacious A-frame cabin style tent with beds, furniture, and a raised floor. The costs range from $15.70 for a bare-bones campsite to $120 per night for a comfortable outdoor experience. This region isn’t mountainous like the parks in the Rockies, so trails have few steep inclines. The trails do however have varying lengths through the different environments and have lots of opportunities for wildlife viewing. Thousands of square kilometres of alpine hinterland stand within Jasper National Park, sitting 305 kilometres away from Calgary. 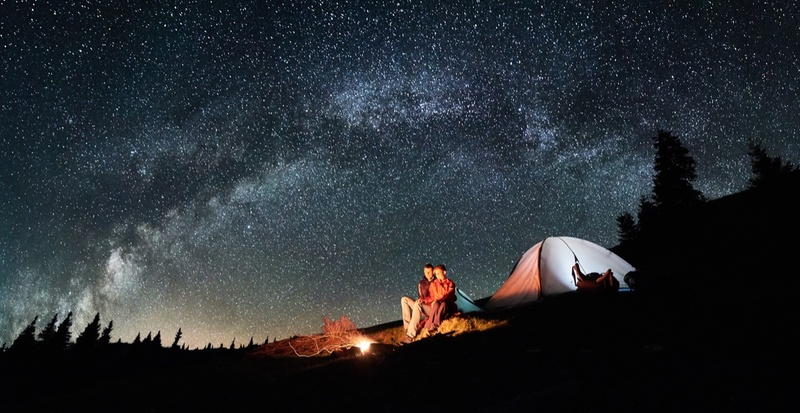 From rugged mountain hikes to the world’s largest accessible dark sky preserve, there are amazing experiences to be had for everyone in Jasper. Camping in Jasper is hugely popular every summer, as there are a wide variety of campsites. Some are first-come-first-serve, barebones sites while others are equipped with luxury tents complete with wood floors, beds, and heaters. Prices range from $15.70 per night to $120 per night, just as with the other parks that have luxury accommodations. Tucked away in the southwest corner of Alberta, 258 kilometres from Calgary, Waterton Lakes National Park borders Glacier National Park in the United States and is considered a World Heritage Site. After a fire damaged a significant area of the park in 2017 there are some parts of Waterton that remain closed to the public. The full information on what is open can be found at the Parks Canada website. Like the other parks, there are many different campgrounds that offer a range of services. Prices range from $15.70 for a barebones site to $38.20 for a site with water, sewer, and electrical services. A full list of open trails can be found here, and the list of trails still closed to the public can be found here. Getting here from Calgary is not for the faint of heart. Nearly 1,500 kilometres away, Wood Buffalo National Park is the largest National Park in Canada and straddles the border between Alberta and the Northwest Territories. Established back in 1922 to protect the world’s largest free-roaming herd of wood bison, the park is bigger than the country of Switzerland and is the second-largest national park in the world. Camping in Wood Buffalo National Park can be as classic or comfortable as you like, with barebones options and cabins both available. For the simple campsites there is a $15.70 nightly fee, and for cabin rentals, it’s $100 per night. Being Canada’s largest National Park, there are countless hiking opportunities in Wood Buffalo National Park. While there are lots of maintained trails, the vast majority of the park is undeveloped backcountry that is ripe for experienced hikers to explore. So, who’s down for a trip to the great outdoors? Lucas Taylor is a Calgarian writer for the Daily Hive. He loves writing about the cultural goings-on in the city and proving that Calgary isn't just oil and cowboy hats... but there is a lot of that.